What else: bring water to drink (and if salt water gives you itches bring extra water to rinse) don’t forget the sunscreen and never leave anything in the car. Today we will discover a few public beaches near the Caracasbaai area of the island. 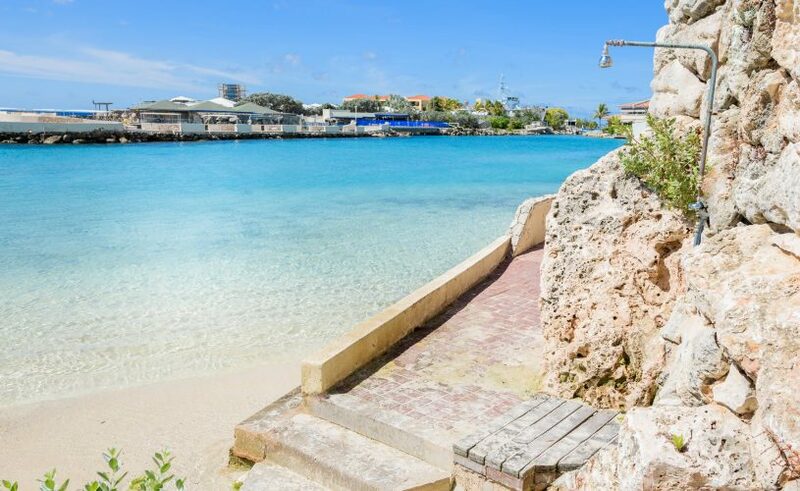 Caracasbaai is a 15 minute drive from the Curacao Luxury Holiday Rentals apartments. The best time for this tour is in the morning. Make sure to make a pit-stop at the Luna Park Market along the Caracasbaaiweg and buy a packet of frozen yellow Arepas (in the freezer in the far right back of the shop) and some fruits for snacking. Now just drive on until you reach the caracasbaai area. By the way never feed fishes bread or other products which contain yeast, the yeast will expand and can cause constipation for most fish, and could kill them. 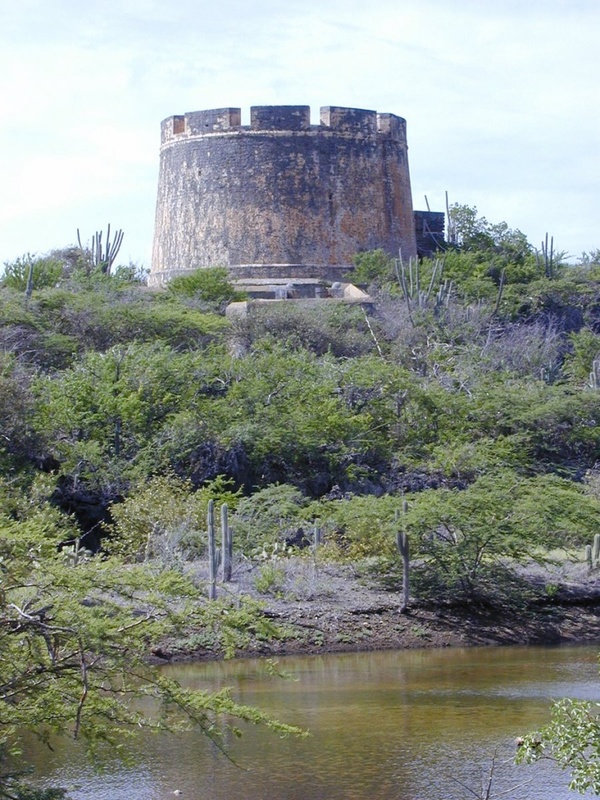 Fort Beekenburg was built in 1703 on Curaçao on the Caracasbaai to defend the Spanish Water area. The fort has a round tower, in the shape of a chess piece. As you reach the fort you can park the car next to the road. From the public road, a stone staircase goes up to the tower, and visitors can climb the tower all the way up. From the top you can enjoy a magnificent view over the Caracas Bay area. It is advisable to wear shoes because of the thorn plants that grow along the paths. We continue our exploration by driving on along the road, we pass ‘Baya beach’ an old manor house that trough the years has been exploited as a beach bar, event center and recently it became a church. The beach if front of the house is nice for lounging and a short swim to cool off after climbing the tower but there is no time to linger. 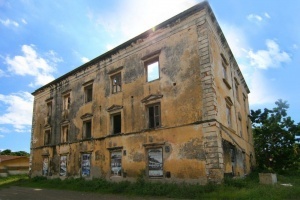 The quarantine building was built in 1883 and designed by the first known architect on Curaçao, Antoine Martis, who worked at the Colony Building Department at that time. The quarantine building was used to accommodate the crew and any passengers from ships on which a disease had spread. The sick were admitted to a hospital at the fort. Sadly the building is in pretty bad shape but it still is a beautiful spot to have a look around and it makes for a beautiful picture setting. In the bay on the right side of the quarantine building we can find the well know dive spot the Tug Boat. It is a small shipwreck at 6 meter deep, which is easy to visit with diving gear. It is possible to park the car next to the diving school and swim to the Tug boat with your snorkel but we will skip that for today as we still have a date with the fishes at another less deeper spot. 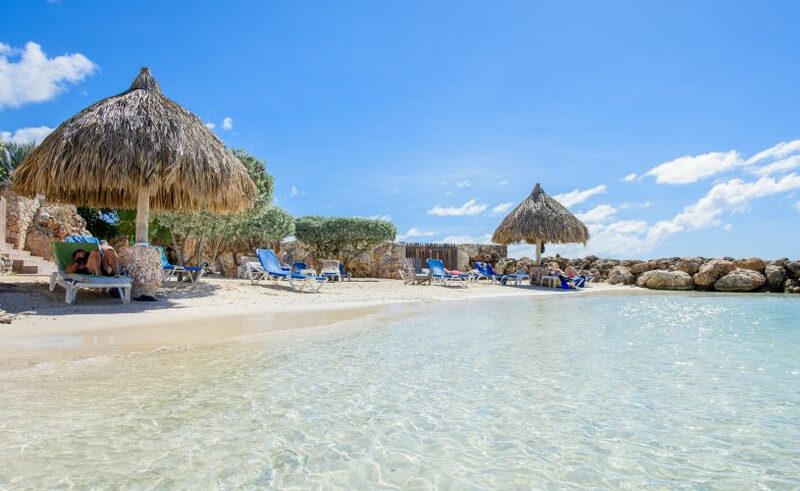 This beautiful beach is a beautiful spot to relax, not too many tourists and beautiful blue water. Take your time to relax, enjoy the sun and your surroundings, and have a bite to eat. After the batteries are charged it’s time to get back to the car for the next adventure, the main adventure of this tour. Get your Arepas ready because we are going to feed the fishes! Finally snorkeling and feeding the fishes. We drive back to the caracasbaai beach and park the car in front of the Golden Seahorse snack. If you are a couple and you both want to snorkel the best advise we can give you, is to ask other people who are enjoying the beach if they can keep an eye on your stuff, or if you could leave your stuff with them while you go for a swim. Now take your snorkel and your Arepas and walk in the water. Swimmers are protected by a line with buoys. The best snorkel and fish feeding spot is right in front of the Golden Seahorse almost up to the buoys. There you will find the rests of anchoring posts that have been transformed into fish hotels with beautiful coral decorations. Once you arrived at the posts and take out some of your Arepas you will find a lot of fishes looking for a snack, the small ones will even try and steal food from your hand. 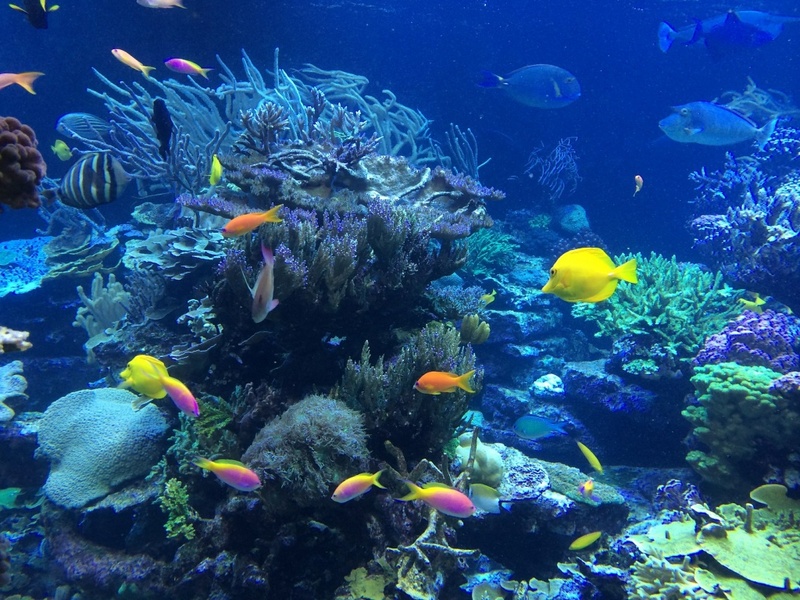 Lot’s of different colorful fish species can be observed and if you are lucky you can spot an octopus or a Murena. 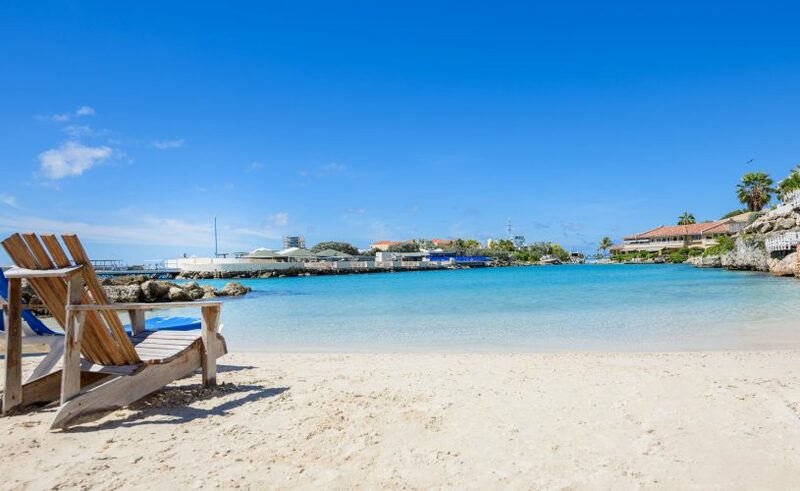 After this beautiful experience it is time to enjoy some real Curacao quisine and the best place to eat happens to be right at the caracasbaai beach, called Pop’s place. 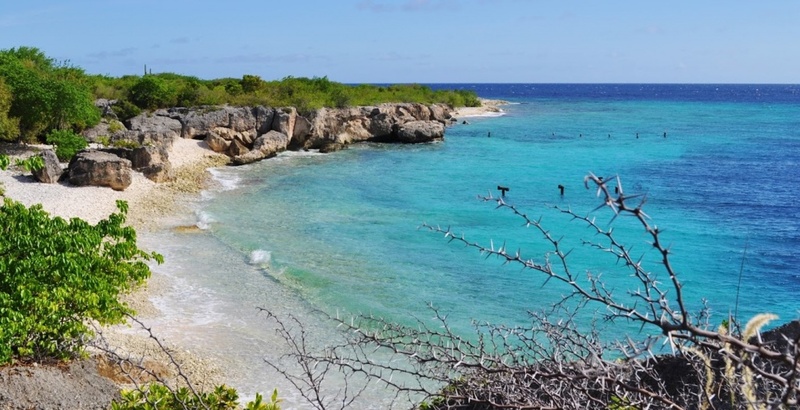 Ruled by Mrs. Poppy you will find tradition Curacao dishes like fried red snapper and stoba. And typical side dishes like funchi and friend plantains and home made lemon juice for a nice refreshment, all for very reasonable prices. Would you like to try this trip? Feel free to ask our guest relations for more information, we even have a set of snorkels you can borrow!